All materials and tools will be provided. $50 sliding scale. There is a maximum of 10 slots. 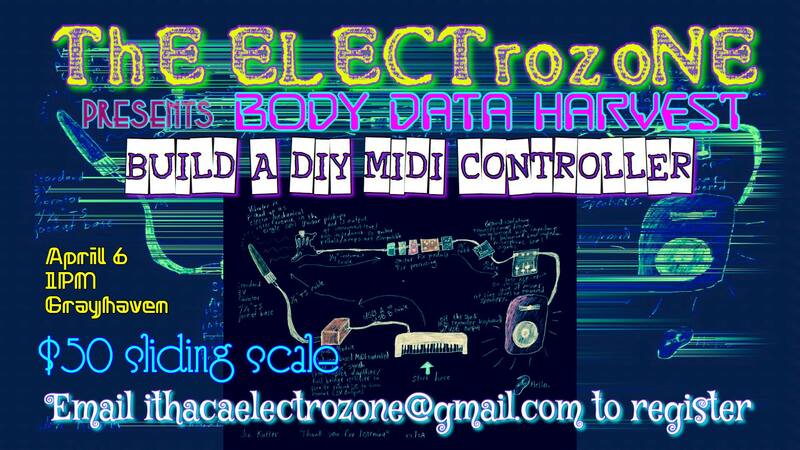 Register at ithacaelectrozone@gmail.com Payments may occur through cash, card, Venmo or Paypal. As always the ElectroZone will livestream this event. The workshop will cover USB-MIDI basics, introduction to Arduino, basics of variable resistors including capacitive touch and light sensors, breadboarding, soldering, imagining basic circuits, writing code to make your instrument work. We will talk about how to create noteOn/noteOff and CC value controllers. In the workshop we will build a simple USB-MIDI CCvalue controller and will give you the tools to expand and build your dream MIDI control setup. Email any questions you might have to jenkutleraudio[at]gmail[dot]com.